The last year hasn’t been the easiest for New York State’s small business community. Aside from the sluggish economy, small businesses have had to deal with the changing landscape of health insurance for their employees, most of which can be attributed to the Affordable Care Act (ACA) taking effect. The result? Business owners have lost time, money, and sleep over all of things they need keep up on with the ACA. However regardless of how much of a pain they may be, businesses need to stay up to date as there are compliance issues and standards that they need to meet. What Affordable Care Act information do my employees need? As a business owner in New York State you are obligated to inform your employees before the start of the next year’s ACA open enrollment season about their small business health insurance options, as well as its relative costs and their eligibility for premium assistance programs such as Medicaid and the children’s Medicaid program known in New York as Child Health Plus. For the 2014 enrollment season the deadline for employers to provide this information to their workers was October 1, 2013, the day that the New York State Health Insurance Exchange officially opened for business. However right around Labor day, a national news story broke reporting that the Obama administration was strong arming small business owners into providing this health insurance information to their employees. The story claimed that businesses would be fined up to $100 a day for not informing their employees about their health care options under the ACA. As you might imagine this story caused quite a stir, but ultimately proved to be false. Small Business Health Insurance. Do I face a penalty? While the Department of Labor (DOL) in 2013 required every company covered by the Fair Labor Standards Act to inform their employees about their company’s small business health insurance options and how they stack up against the ACA’s options, there was no penalty for failing to do whether intentionally or otherwise. It’s important to note the date on this notice. While it appears likely that the same policy will be in place for the start of the 2015 open enrollment season on November 15, 2014, it’s possible that it may change and include steeper penalties for noncompliance. Regardless of whether there will be a penalty for not doing so later this year, it’s a good idea to let your employees know what their health insurance options are under the ACA and how they stack up against what the company offers. 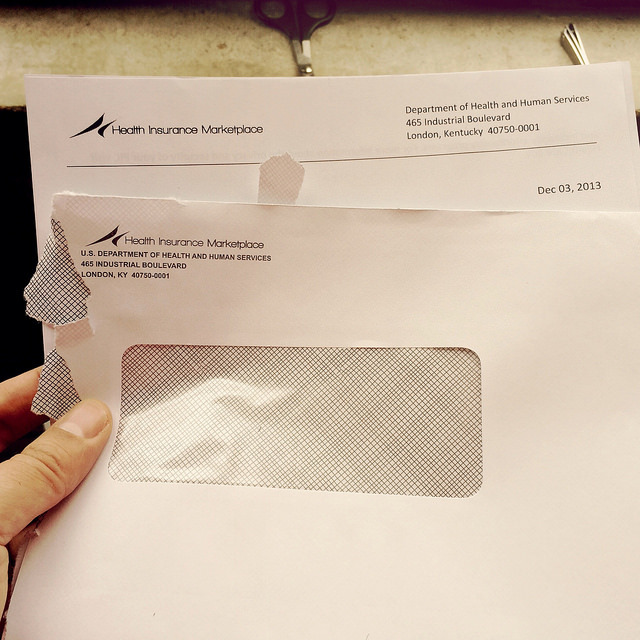 So what information should you include in a the health insurance notice to your employees? First, the letter should contain detailed information about just what the New York’s Health Insurance Exchange is, and where employees can go to learn more should they choose to do so. Next the notice needs to inform employees about the current coverage options through their job. Meaning the health insurance options they currently have available to them, and then how they stack up in terms of price and coverage against a New York State Health Insurance Exchange plan. This section should also touch on the issue of federal health insurance subsidies. Employees whose income levels between 133 and 400 percent of the current year’s Federal Poverty Level (FPL) are technically eligible to receive a health insurance subsidy from the federal government. However it’s important to note that if their employer provided coverage is considered both affordable and comprehensive enough by federal standards then they will not get a subsidy even if their income would otherwise qualify them. Your accounting of employees’ health insurance options needs to take the possibility of a subsidy into account. Specifically it should state how it is possible that they may be able to receive a lower priced health insurance plan by shopping at the New York State Health Insurance Exchange when the subsidy is included. Finally, the letter should also include a warning to employees saying that they will lose any employer contribution to their health insurance plan if they choose to purchase a New York State Health Insurance Exchange plan. For many workers, especially those with lower incomes, opting out of the employer sponsored health insurance plan and going to the exchange will make more fiscal sense. But for others, particularly those worker with higher incomes and employed with businesses offering older, grandfathered PPO style health insurance plans, it will probably be in their best interest to remain on the employer health plan. The Department of Labor has a template letter on their website that is free for you to use and modify for your own purposes to inform your employees. The DOL also recently updated their template letter for employers in the event that a worker becomes eligible for COBRA coverage after a qualifying event. This updated COBRA letter simply includes additional language informing the recipient of the other option to enroll at the New York State Health Insurance Exchange rather than participating in COBRA.